They say ‘Every Picture Tells a Story’ and these pictures show the talent and enthusiasm we have in our group. Thank you to everyone who contributed to make our show a success. The Sales Table true to form was as popular as ever and we wish to thank everyone who made items for their efforts there was some exquisite work. Also in the Assembly Room was our Vegetable Stall offering a variety or hand made vegetables by our enthusiastic members. We had a wonderful variety of work in the tea and cake area along with our UFO table which was popular and our Christmas corner. Other items on display was our 20th Anniversary Challenge, My Home in A3, a selection of items made at various workshops and the Challenge Six groups beautiful items. 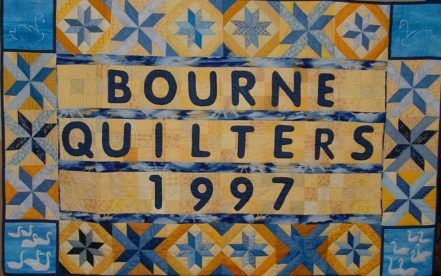 The winner of Betty’s Quilt that was made by Margaret was won by Pauline, many of our members were very envious as it is such a beautiful quilt. This is evening we were preparing for the forthcoming Quilt show and were arranging items for the sales table and planning details for the weekend helpers. We also had a ‘show and tell’ of the sashes that have been made by various members to identify ourselves to visitors during the show. A productive evening organising items for the quilt show and sales table. The library is more popular now we have moved it into the main hall. A great show and tell of workshop projects and members personal items. Many thanks to everyone who brought along their beautiful work. We had the pleasure of Jenny Rundle at our meeting this month. Jenny delighted us not only with her lovely quilts but told us about her BEM. Well done Jenny on a wonderful achievement. It was interesting to hear about the Olympic quilts and Jenny also explained to us why she calls herself a Patchworker and not a Quilter – she rarely quilts her own quilts – hence her choice of Patchworker. Jenny shared with us her experience of entering quilts at the Festival of Quilts and showed us some of her entries. Jenny then went on to show us her Pizzaz quilts and many of us have signed up to do her forthcoming workshop. Slideshow below. We began the New Year and evening with a very inspiring and informative talk from Jill Rose Brennan. Jill is a talented Quilter and seamtress and shared with us her sewing experiences since childhood. The samples of quilts and wallhanging Jill brought with her varied from vintage to up to date items created in her studio. We started the evening with a show and tell of a few sashes that we are making for our Quilt show later this year. Many thanks for bringing them along ladies. We then enjoyed Jill’s talk and exhibits. I hope you enjoy the slide show. A brief and to the point AGM, a plethora Show and Tell followed by mulled wine and nibbles. A wonderful way to end our celebration year. Enjoy the slideshow below.